The goldfish (Carassius auratus auratus) is a freshwater fish in the family Cyprinidae of order Cypriniformes. Favourite Food - Pellets, flakes, and live prey such as worms. Vegetable such as boiled peas. The ancestors of the common goldfish were dull-colored carp. Ornamental breeds of carp were bred by the Chinese sometimes during the reign of the Sung Dynasty, which ruled China from 960-1279. Around the 13th century, during the reign of the Nan Song Dynasty, goldfish became common pets throughout China. Eventhough the goldfish is native to asia, it is also found in many other locations throughout the world. Goldfish were first introduced to North America around the late 1900s. 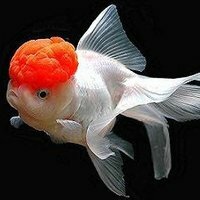 The Chinese have bred and kept goldfish for over a 1000 years.. They were the first to breed this unique carp, creating ornamental varieties from the original wild goldfish, which can grow up to 30 cm in length and weigh around 2.5 kg. Wild goldfish live in lakes, ponds, streams and rivers. Over the centuries , many goldfish varieties have been developed with strange and unique shapes. Most modern goldfish varieties were derived from the common goldfish, which doesn't look that much different from its wild ancestor other than the colors. It is a rather hardy goldfish that can thrive and live happily in an aquarium or pond. This particular goldfish variety can grow very large if given adequate space, often reaching a length of greater than ten inches and has a lifespan that can exceeed decade or more. The caudal peduncle of the common goldfish is wider and deeper than the comet goldfish, and its body is tapered at the head. Common goldfish can have colors ranging from orange to red, including blue, brown and other color combinations. They also have a variety of beautiful patterns that can be silver or metallic in color. Goldfish are social animals that prefer living in groups and there are many different goldfish species. Goldfish are the domesticated Asiatic subspecies of Carassius auratus, the gibel carp, a species that naturally shows a wide range of morphological variation when raised in different environments. Goldfish range from 2 to about 18 inches (5 to 45 cm) in length and and 0.5kg to 2.5 kg in weight. Ideally, this goldfish should be kept in at least 25 - 40 gallons of water. Although an aquarium heater is not required, it's still a good idea too have one on hand for emergency. The water temperature for it should kept around 65 -78' F . One must also remember that goldfish must eat , swim, breathe , and drink in the same water that they live in, so water quality for the fish must be taken seriously. A good water filter is usually required in order to to keep goldfish healthy and to maintain safe water conditions for the fish. Some water parameters that need to be checked when setting up a new tank and also once the tank is established are the ammonia, nitrite, nitrate, and pH levels. Goldfish can be fed many different varieties of commercially available foods. These include dried pellets, flakes, and live foods such as bloodworms, mosquito larvae, brine shrimps, and tubifex worms. Goldfish prefer a pH around 7.2 to 7.6 , however they can tolerate a pH as high as 8.0. They like water that is moderately hard but can survive in water that range from very hard to very soft. Goldfish are freshwater fish, but they have some tolerance for slightly brackish water. Any salinity for must be kept low, below 10%, a specific gravity of less than 1.002. Tank sizeFifteen gallons is the suggested minimum required to house a Shubunkin Goldfish. It's best to start with a 20 - 30 gallon tank for your first goldfish and then increase the size of the tank by 10 gallons for each additional goldfish. Providing a large amount of water per fish will help dilute the amount of waste and reduce the number of water changes needed. Tank ShapeAlways provide the maximum amount of surface area. A large surface area of water will help minimize goldfish suffering from an oxygen shortage. Surface area is determined by the shape of the tank. For example an elongated tank offers more surface area (and oxygen) than a tall tank. In an oval or round shaped tank the middle offers more surface area than filling it to the top. Number of fishFor juveniles a general rule of thumb is 1 inch of fish (2.54 cm) per 1 gallon of water. But this rule only applies to young fish and is not adequate as they grow. Larger gold fish consume much more oxygen than young fish so maintaining this formula for growing fish will stunt them, and can contribute to disease and even death. Fish size and growthTo allow for proper growth, either buy fewer fish than the maximum number or be prepared to get a larger tank. To prevent stunted growth and other health problems, don't overstocking the aquarium. Goldfish are a cold water fish and will do best at temperatures between 65 - 72° F (18°- 22° C). only change about 20-30% of the water in the fish tank each time, instead of all the water at once. The reason we only perform a partial water change each time is that so that we can preserve the beneficial bacteria that is present in the water. The purpose of these beneficial bacteria is to help break down toxic fish wastes. before placing the new water into the fish tank, allow it to stand for a few days so that the chlorine can evaporate. This step is not necessary if a water conditioner is used. Regular maintenance and water-quality checks help keep diseases away from goldfish, but illnesses still occur, even in the best-kept aquariums and ponds. The first sign of a problem may be a goldfish floating at the surface, by which time it is probably too late for effective treatment. For this reason , it is vital to set up a routine for examining fish; feeding time provides an ideal opportunity to check their appearance and behavior. Fancy goldfish are more susceptible to different diseases, including bacterial, viral, and fungal, than the flat body type goldfish such as shubunkin and comet goldfish. As a result they are more prone to becoming ill and sick when kept in less than ideal conditions.